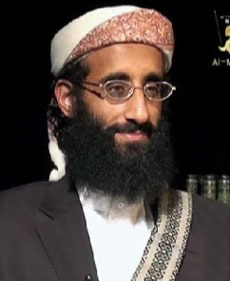 The son of a Yemeni agronomer, al-Awlaki was born in the US but spent his teenage years in Yemen. He returned to Colorado for an engineering degree, spending one summer training in Afghanistan. After graduation, the young man passed as an uncontroversial imam among moderate congregations first in Denver, and later San Diego and Falls Church, Virginia. Three of the 9/11 hijackers reportedly met with him in 2000; American officials detained him at the airport in 2002 over a bureaucratic curiosity involving his passport. Returning to Yemen in 2004, he taught at Iman University in Sana'a until 2006 when, accused in a kidnapping plot, he was jailed for a year and a half, but charges were dropped. Emerging in the late 00s as a successful video blogger, he corresponded with Fort Hood shooter Nidal Malik Hasan and Times Square bomber Faisal Shahzad. Roshonara Choudhry, the attempted assassin of British MP Stephen Timms, claimed to have been radicalized by watching hours of his sermons online. Associated with al-Qaeda in the Arabian Peninsula (AQAP) soon after its formation in January 2009, he apparently trained the underwear bomber Umar Farouk Abdulmutallab, and was the target of an American drone strike a day before the foiled Christmas attack -- making him unique as an American citizen explicitly targeted for assassination without any judicial process. Formal charges were filed against him in a Yemeni court in late 2010, and his YouTube sermons were roundly censored at the request of the American and British governments.